BEIRUT, Nov 21 (IPS) – October and November have been bloody months for Lebanon’s migrant domestic workers – over the last five weeks nine women have died. Most deaths have been reported as suicide. The body of 20-year old Anget R. of Madagascar was found hanging from a rope at her employer’s bedroom door Nov. 11. A newspaper in Madagascar reported the deaths of two other Malagasy women in October. One, identified only as Mampionona, was said to have fallen from the balcony of her employer’s house. The other, identified as Vololona, died after reportedly jumping from the balcony. Sunit Bholan of Nepal, who was 22, allegedly committed suicide Oct. 8. Ethiopian Kassaye Etsegenet, 23, died after reportedly jumping from the seventh floor of her employer’s house Oct. 15. She left behind a suicide note citing personal reasons. On Oct. 21, 26-year-old Zeditu Kebede Matente of Ethiopia was found dead, hanging from an olive tree. Two days later 30-year old Saneet Mariam also of Ethiopia died after allegedly falling from the balcony of her employer’s house. The list goes on: Nepalese national Mina Rokaya, 24, and then Tezeta Yalmoya of Ethiopia, 26 – who also died, it was said, when she fell from the balcony. “It’s a national tragedy,” Nadim Houry, senior researcher at Human Rights Watch, tells IPS. There are an estimated 200,000 women working in Lebanon as live-in housekeepers, cooks and nannies. Most are from Sri Lanka, Ethiopia and the Philippines, though increasing numbers are arriving from Nepal, Madagascar and Bangladesh. The workers leave their families behind to travel to Lebanon and look after strangers. Many are treated well by their employers; others are less fortunate. Once in Lebanon, the women may be confined to their employer’s house, and have their passports confiscated and their salaries withheld, increasing their sense of isolation. Many women say they are not allowed out of the house, or get a day off. Complaints of sexual or psychological abuse are not uncommon. Lebanon’s controversial sponsorship system means that workers are bound to their employers, and face incarceration if they leave. “It’s distressing to note that suicide for some is the only recourse to release from an abusive situation,” says Azfar Khan, senior migration specialist at the International Labour Organisation (ILO) regional office for the Arab states. Police investigations are often inadequate, usually taking into consideration only the employer’s testimony and failing to cross-check it with neighbours or the worker’s friends or family, says Houry. If the woman is lucky enough to survive a suicide attempt, the police almost never provide her with a translator, or ask whether she had been abused. Cases where abusive employers are imprisoned “are the exception, not the rule,” says Houry. The recent spate of deaths is not the first. A HRW study last year found that at least 95 women had died between Jan. 1, 2007 and Aug. 15, 2008 – a rate of more than one a week. Aimee, a freelance domestic worker from Madagascar, has been in Lebanon for almost 12 years. As a community leader now, she helps workers in distress by offering a sympathetic ear and advice. Lebanon’s growing notoriety as a hotbed for abuse of rights has compelled the governments of Ethiopia and the Philippines to issue bans on their nationals working in Lebanon. But this hasn’t stemmed the tide of migrants entering through third countries. Bans in any case only “transfer the problem from one nationality to another,” says Houry, because recruitment agencies simply look to new countries for women workers. One reason for suicides is the false expectations recruitment agencies raise among migrant workers. Many women are led to believe they will work as nurses or as other professionals. “A lot of these women are recruited in rural areas – it’s like taking someone and plucking them into a totally different environment,” says Houry. Lebanese labour laws do not cover domestic workers. Without any legal protection, foreign workers are vulnerable to exploitation. Lebanon has signed the International Convention against Torture and other Cruel, Inhuman and Degrading Treatment or Punishment, but has yet to move towards signing the Convention on the Protection of the Rights of All Migrant Workers and Members of their Families – a measure that would obligate it to take protection measures for the migrant community. SARAFAND: During the hey-day of the Phoenician civilization, the trading post of ancient Serepta would have had a thriving artisan community with glass makers, potters and timber merchant selling their wares to sea-farers. Today Serepta is better known as Sarafand – a sleepy run-down village in southern Lebanon with pot-holed roads where no one seems to loiter too long. The potters and glass blowers have long gone, with mechanics and kebab vendors taking their place. Lebanon’s once thriving glass trade hasn’t completely died out, however. One family is determinedly keeping the ancient tradition alive, albeit with considerable difficulty. The Khalifeh family has been blowing glass for about 40 years, selling their goods in a local shop or to wholesalers. In happier times, says shop manager Nisrine Khalifeh, her grandfather taught apprentices the painstaking trade and employed several dozen locals. The family had a thriving business, helped along by exposure at international craft fairs and friendly tour guides who would bring generous-spending Beirutis to the shop. Today, Nisrine’s father Hussein runs the business but the locals aren’t interested in working with glass. “No one likes to do it because it’s so hard,” Nisrine says with a sigh. “Many people have asked to learn but then they can’t handle the heat.” She points to her father, who at 55 years old looks more like 85. His face has been leathered and shoulders hunched by years sweating it out in front of the oven, designing and shaping glass in 140 degree heat. The future of Lebanon’s glass-blowing heritage now rests in the hands of Hussein, Nisrine and seven other family members. The dearth of trained glass blowers has been accompanied by decreasing sales at the Khalifeh’s shop in Sarafand. Despite the undeniable appeal of the shop’s colorful interior, with its rainbow of ornate standing candle holders, hanging decorations, water jugs and vases, hardly anyone ever visits. When the southern coastal highway opened a few years ago, business at the Khalifeh shop, which is situated on the old coastal road, was hard hit. Now, says Nisrine, the only people that come to the shop are foreign clients who might not have visited in a few years or soldiers from UN peacekeeping force UNIFIL looking for presents to take home. “When the autostrade was closed a few months ago and people had to travel on the coastal road, a lot of people came in and bought things,” she says. 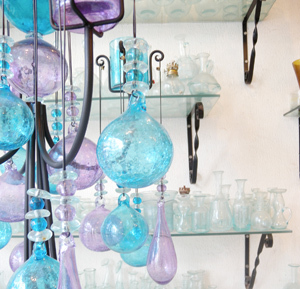 With only the most motivated clients bothering to make the journey, the Khalifeh family’s glass products are one of Lebanon’s best-kept secrets. Ever-rising fuel costs are also taking a toll. Because of the exorbitant prices, the Khalifehs only turn on the ovens for big orders to highbrow boutiques in Beirut who then sell the glass products for double or triple the original price. The oven costs $500 each day to run and takes 24 hours to reach 1,500 degrees, the temperature where glass finally turns to liquid. “Sometimes we stop for two or three months because there’s no work,” Nisrine says. When The Daily Star visited, the ovens had been off for some time. The ovens themselves are also expensive to keep, as they can only be used twice before the intense heat turns the bricks to sand. Apart from the high fuel consumption, the Khalifeh’s glass production is environmentally sound, using only recycled glass. Behind the shop, rusty bath tubs and old oil vats groan under the weight of shattered beer and wine bottles, mirrors and windows.